Morgan Earp was born in Iowa on 24th April, 1851. His father moved the family, to San Bernardino, California in 1864. He joined his older brother Wyatt Earp in Dodge City. In 1880 he moved to Tombstone with his three brothers, James Earp, Wyatt Earp and Virgil Earp. In October 1880, Virgil Earp became city marshal of Tombstone. Soon afterwards he recruited Wyatt and Morgan as "special deputy policemen". Over the next few months the Earp family came into conflict with two families, the Clantons and the McLaurys. Ike Clanton, Phineas Clanton, Billy Clanton, Tom McLaury and Frank McLaury sold livestock to Tombstone. Virgil Earp brothers believed that some of these animals had been stolen from farmers in Mexico. Wyatt Earp was also convinced that the Clanton brothers had stolen one of his horses. Wyatt Earp also came into conflict with John Behan, the sheriff of Cochise County. At first this started as a quarrel over a woman, Josephine Sarah Marcus. She had lived with Behan before becoming Earp's third wife. Earp also wanted Behan's job and planned to run against him in the next election. The two men also clashed over the decision by Behan to arrest Doc Holliday on suspicion of killing a stage driver during an attempted hold-up outside of town. Holliday protested his innocence and he was eventually released. In September 1881, Virgil Earp retaliated by arresting one of Behan's deputies, Frank Stilwell, for holding up a stagecoach. On 25th October, Ike Clanton and Tom McLaury arrived in Tombstone. Later that day Doc Holliday got into a fight with Ike Clanton in the Alhambra Saloon. Holliday wanted a gunfight with Clanton, but he declined the offer and walked off. The following day Ike Clanton and Tom McLaury were arrested by Virgil Earp and charged with carrying firearms within the city limits. After they were disarmed and released, the two men joined Billy Clanton and Frank McLaury, who had just arrived in town. The men gathered at a place called the OK Corral in Fremont Street. Virgil Earp now decided to disarm Billy Clanton and Frank McLaury and recruited Morgan Earp, Wyatt Earp, James Earp and Doc Holliday to help him in this dangerous task. Sheriff John Behan was in town and when he heard what was happening he raced to Fremont Street and urged Billy Clanton and Frank McLaury to hand over their guns to him. They replied: "Not unless you first disarm the Earps". Behan now headed towards the advancing group of men. He pleaded for Virgil Earp not to get involved in a shoot-out but he was brushed aside as the four men carried on walking towards the OK Corral. Virgil Earp said: "I want your guns". Billy Clanton responded by firing at Wyatt Earp. He missed and Morgan Earp successfully fired two bullets at Billy Clanton and he fell back against a wall. Meanwhile Wyatt Earp fired at Frank McLaury. The bullet hit him in the stomach and he fell to the ground. Ike Clanton and Tom McLaury were both unarmed and tried to run away. Clanton was successful but Doc Holliday shot McLaury in the back. Billy Clanton and Frank McLaury, although seriously wounded, continued to fire their guns and in the next couple of seconds Virgil Earp, Morgan Earp and Doc Holliday were all wounded. Wyatt Earp was unscathed and he managed to finish off Billy Clanton and Frank McLaury. Sheriff John Behan arrested Virgil Earp, Wyatt Earp, Morgan Earp and Doc Holliday for murder of Billy Clanton, Tom McLaury and Frank McLaury. However, after a 30 day trial Judge Wells Spicer, who was related to the Earps, decided that the defendants had been justified in their actions. Over the next few months the Earp brothers struggled to retain hold control over Tombstone. 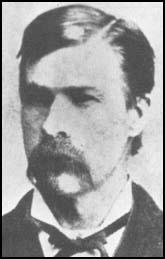 On 28th December, Virgil Earp was seriously wounded in the left arm by an attempted assassination. Morgan Earp was killed when he was playing billiards with Wyatt Earp on 18th March, 1882. Eyewitnesses claimed that Frank Stilwell was seen running from the scene of the crime. Three days later Stilwell's was found dead. A Mexican who was also implicated in the crime was also found murdered in a lumber camp. It is believed that Wyatt Earp was responsible for both men's death. Virgil Earp and James Earp took Morgan's body to home of his parents in Colton, California, for burial. A Tombstone, Arizona, dispatch says: Four cowboys, Ike and Billy Clanton and Frank and Tom McLaury, have been parading the town for several days drinking heavily and making themselves obnoxious. On Wednesday last the city marshal Virgil Earp arrested Ike Clanton. Soon after his release the four met the marshal, his brother Morgan and Wyatt Earp, and a citizen named (John H. "Doc") Holliday. The marshal ordered them to give up their weapons, when a fight commenced. About thirty shots were fired rapidly. Both the McLaury boys were killed. Bill Clanton was mortally wounded, dying soon after. Ike was slightly wounded in the shoulder. Wyatt Earp was slightly wounded, and the others were unhurt. The Earp boys, who had the fight with the cowboys, at Tombstone, Arizona, which resulted in the killing of three cow boys, have been arrested by the friends of the men who were killed. The Earp boys were acting as peace officers, and from all reports were justified in doing what they did. Wyatt Earp was formerly city marshal of Dodge City, and a paper setting forth his good qualities was circulated last week and signed by all the prominent citizens. Wyatt Earp, formerly a city marshal in this city, was recently under trial before a magistrate in Tombstone, Arizona, charged with homicide. Great interest was taken in trial which lasted four weeks. From the voluminous testimony taken the Justice makes a long review of the case and discharges the defendant. The following is an extract from his decision: "In view of all the facts and circumstances of the case; considering the threats made the character and position of the parties, and the tragical results accomplished in manner and form as they were, with all surrounding influences bearing upon the res gestae of the affair, I cannot resist the conclusion that the defendants were fully justified in committing these homicides; that it was a necessary act done m the discharge of an official duty." Nineteen shots struck the side of the Eagle Brewery, three going through the window and one passing about a foot over the heads of some men standing by a faro-table. The shooting caused the wildest excitement in the town where the feeling between the two factions runs high. Wyatt Earp arrived here some days ago and will remain awhile. Wyatt is more robust than when a resident of Dodge, but in other respects is unchanged. His story of the long contest with the cowboys of Arizona is of absorbing interest. Of the five brothers four yet live, and in return for the assassination of Morgan Earp they have handed seven cowboys "over to the majority." Of the six who actually participated in the assassination they have killed three - among them. Curly Bill, whom Wyatt believes killed Mike Meagher, at Caldwell, last summer. Frank Stillwell, Curly Bill and party ambuscaded the Earp party and poured a deadly fire into them, Wyatt receiving a charge of buckshot through his overcoat on each side of his body and having the horn of his saddle shot off. Wyatt says after the first shock he could distinguish David Rudebaugh and Curly Bill, the latter's body showing well among the bushes. Wyatt lost no time in taking him in, and will receive the reward of $1,000 offered. From what I could leam, the Earps have killed all, or nearly all of the leaders of the element of cow boys, who number in all about 150, and the troubles in Arizona will, so far as they are concerned, be over. Wyatt expects to become a candidate for sheriff of Cochise county this fall, and as he stands very near to the Governor and all the good citizens of Tombstone and other camps in Cochise county he will without doubt be elected. The office is said to be worth $25,000 per annum and will not be bad to take.